Examination of virtual worlds, games, communities & their paradigms. Also let's look at user interface design and layout! A good resume does more than just get your foot in the door—it embodies the way you convey yourself as a professional. The assistant at the printing store notices it, the hiring manager needs to get hooked on it, and your peers covet it. I am constantly boggled over how many graphic design resumes replicate the same basic problems. That’s Not How Bleeds Work. Most printers don’t print bleeds. What’s a bleed? 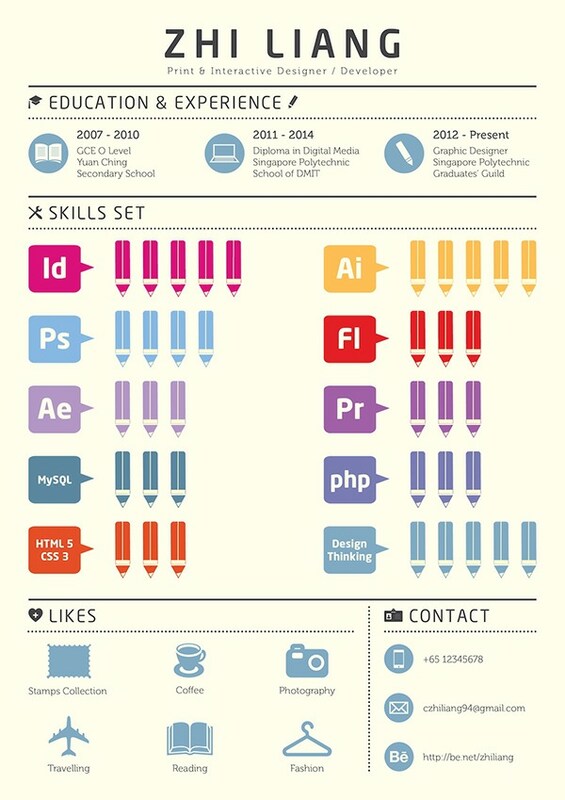 A quick Pinterest search for graphic designer resume brings up a bleed-y mess. When was the last time your inkjet printer at home printed ink to the edge of the page? Unless you’re savvy with printer settings, I’m going to reckon never. Combine that with interviewers printing resumes and you get your cute color border bordered by white in the middle of a page. All of your copy shrinks and becomes harder to read. Your cute border works best digitally or professionally printed. If you’re applying for jobs online, don’t bleed. Have an in-person and an online version of your resume. The in-person copy gets used at job fairs or at the actual interview. Because you provide this copy, you can manage the bleed and make sure it doesn’t screw over the rest of your resume. The online version doesn’t have a bleed. You can do it! Make it look good and printer-optimized. Even better yet, practice printing it on all kinds of printers, in color and black and white and see how it looks. A good designer envisions all outcomes. The Typography is Your Voice. Times New Roman is like “putting on sweatpants,” according to Brian Hoff, creative director of Brian Hoff design, in a Bloomberg Business article about resume font choice. But, it’s not the use of Times New Roman that’s confusing, it’s the trend of illegible typefaces used by graphic designers. A graphic designer friend recently asked me to review her resume. The most glaring problem was her use of a small x-height, wide x-width typeface, which didn’t communicate PR maven or anything like it. She saw the font online, liked it, and decided to use it on her resume. The typeface “Dennes Old Handwriting”, found on ufonts, isn’t appropriate for most resumes. There are lots of free typefaces online. There are lots of bad free typefaces online that should not touch the main copy of your resume. This is all about branding. What typeface embodies you, the designer? For usability, you probably want to pick something in a large font family and something that compliments the display font you want to use elsewhere on your resume. This font should be easy to read quickly. Pick something with a tall x-height. Don’t be afraid to use a Helvetica. I recently had a CEO tell me that he loved my resume typography. It was Helvetica Neue Light with wide kerning. Use your display typeface to break up the monotony in headers, not the body copy. Your Made-Up Charts Tell Us Nothing. You’re three pencils at Adobe Premiere and five in Adobe InDesign. This guy is 20% of a pie chart in Adobe Illustrator and 60% of a pie chart in stamp collecting. Wow. Readers don’t understand your made-up information scale. Zhi Liang’s infographic resume uses a scale of pencils to convey proficiencies. Really, I get it. You like infographics. Every agency wants to make them; every client wants to display them. But this is not the time or place for using abstraction to explain your perceived proficiency in a program or skill. Those types of metrics don’t make good infographics, and they don’t make good resumes. A resume is your chance to provide concrete examples to back up claims of skills and proficiencies. Don’t just say you’re good at HTML; provide the reason we should think you’re good. Evidence of practiced skill is much more useful than a chart of perceived skill. If you used Adobe InDesign while a page layout designer for four separate publications, a hiring manager can deduce that you know how to use this software. 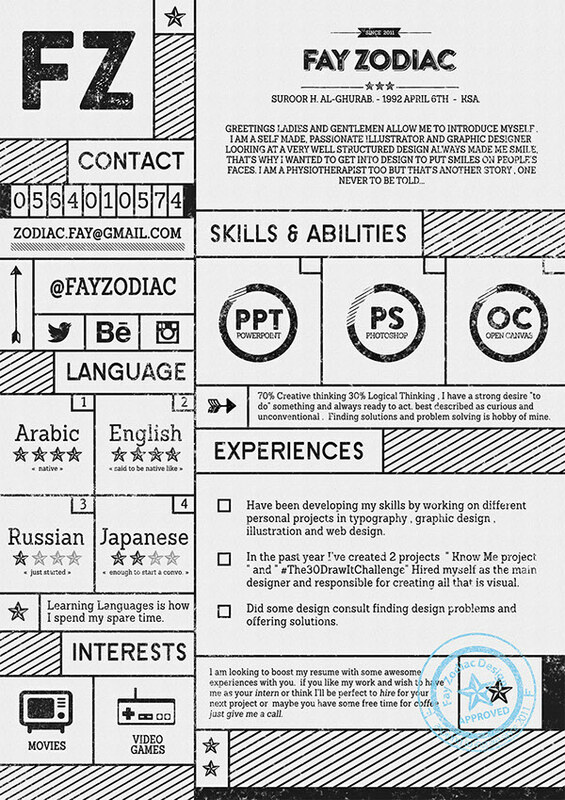 Fay Zodiac’s resume from a free template he provides on Behance. When you’re putting together a resume, it should look inviting and well constructed. Breathing room around your copy and design elements de-clutters the space. Engaged whitespace makes a piece look intelligent. A lack of whitespace makes a piece feel convoluted. Design elements for the sake of design elements can overwhelm a reader. Hiring managers spend a short amount of time looking at each resume. Don’t intimidate the audience you’re trying to engage. But Too Much Whitespace Is Bad. 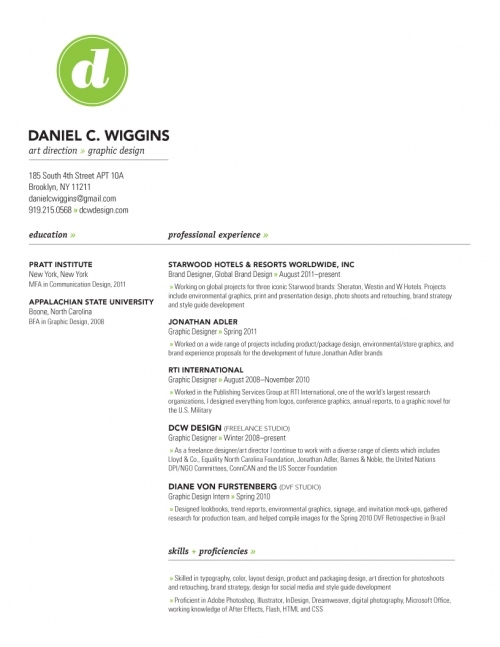 Daniel Wiggins of DCWDesign Blog‘s resume features vast valleys of vacancy. Do you ever look at a resume that’s overwhelmingly blank and think, “but where’s their experience?” The silly infographics crowd excels in engaging their empty spaces. Though whitespace makes a composition look sophisticated, that appeal is lost when the whitespace is unengaged or poorly managed. I’m sure there’s something you can come up with to put there, like URLs for your Behance or Twitter. My beef with designers here is that minimal doesn’t mean barren of utility. Use that prime real estate to sell yourself. You’re creative. Your resume deserves more than vast valleys of vacancy. All Graphics Should Be Amazing. “Every magazine should be award winning.” I bring this philosophy into every composition critique. If you’re capable of delivering a high tier of work, evidence of this talent should riddle your resume. I see this in-person more than I see it online: designers slapping shoddy graphics they threw together in InDesign on their resumes. Bruh. We both know that if you spent 15 minutes in Illustrator, you could develop something much better. This is your resume. Let it echo your portfolio. Don’t put a 5-minute design on your resume. Every element should be carefully sculpted. The devil’s in the details. 7. Rules Should Be Broken. While you were reading this, you probably the thought, “that’s not true for (specific occasion / person).” You’re probably right. Depending on where you’re applying, different considerations take precedence. A designer applying to a traditional corporation handling communication design (B2B, internal) needs to apply the above advice generously. If you’re a great designer, you should be able to adapt your talents to a new target demographic. Buckle down and get yourself hired! With 25 years of experience and a good portfolio, that should definitely stand for itself! To clarify, I’m in no way saying a resume should only be text. The audience dictates the design :). Thanks for the like & feedback!